"No other product on the market makes such huge strides in application ease and job site efficiency like Quik-Shield 108"
SWD Urethane, a spray polyurethane foam (SPF) manufacturer in the southwestern United States, has announced the release of their new Quik Shield 108 Ultra-Low Density SPF, creating a revolutionary new category of open-cell spray foam insulation. Quik-Shield 108 is the first Ultra-Low Density product ever, at a nominal 0.4 lbs./cu. ft. This gives a 25% greater yield over traditional 0.5 lbs./cu. ft. open-cell spray foam. 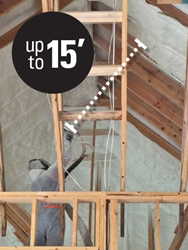 Greater yield significantly reduces material cost for projects, allowing contractors to be more competitive in bids.Quik-Shield 108 bridges the price gap between superior performing spray foam and the cheaper traditional insulation products. Revolutionary Expansion and 360° Cavity Fill—enables applicators to fill an entire wall cavity with a single, zipping motion: This reduces applicator fatigue and increases job productivity by up to 20%. Long-Range Application—applicators can now spray an 8-inch pass on a roof deck from up to 15 feet away without the foam dripping or falling off the deck. Contractors can do away with ladders and scaffolding in some instances, which makes the job safer and less time-consuming. SWD Urethane is a leading supplier of spray polyurethane foam, manufacturing over 100 types of polyurethane foams and polyurea coatings. From 2014 – 2016, SWD has helped its contractors win 26 out of 60 SPFA Industry Excellence Awards. SWD has been in business since 1972, and they are one of the fastest-growing spray foam suppliers in the industry. SWD president, Jim Perkins, is also the chairman of the Spray Foam Coalition, a key trade organization for spray foam suppliers. For more information, contact Alan Annis, Marketing Director, at 800-828-1394 or marketing(at)swdurethane(dot)com. Ultra-Low density, revolutionary expansion, and Long-Range application makes Quik-Shield 108 the foam that every applicator loves.